A significant debate has steadily developed for quite some time within the ranks of Christian scholarship. It pertains to how biblical scholars and theologians can find methodological harmony between the exegetical task of interpreting Scripture and the related theological endeavors to synthesize biblical teachings in systematic confessional form. There are numerous reasons why differences of opinion exist on this question. However, the growing impasse among some in recent decades has jumpstarted a conversation regarding an alternative strategy that has come to be known as the Theological Interpretation of Scripture (TIS). Though this movement is extremely diverse because it is being discussed by scholars all over the theological spectrum, many evangelicals are contributing to the conversation because they recognize the importance of both biblical studies and theological formulation. Consequently, the Fall 2017 edition of CTR is dedicated to this subject. Herein, readers can engage articles from several scholars who address various facets of this important issue. Our lead article is written by Hans Boersma who serves as J. I. Packer Professor of Theology at Regent College in Vancouver, British Columbia. Drawing from a chapter in his recent book entitled Scripture as Real Presence: Sacramental Presence in the Early Church (Baker, 2017), Boersma argues that Scripture was originally viewed by the early church fathers not only as divine revelation that documents God’s acts in history. It was also treated as a means of convergence between heavenly reality and human communication whereby readers could encounter divine grace. Thus, the production of Scripture by the original authors as well as the church’s activity of biblical interpretation were seen as “sacramental” activities. Our second article is by Erin Heim who serves as Assistant Professor of New Testament at Denver Seminary in Littleton, Colorado. Heim engages the work of Murray Rae who is an active voice in the discussion of TIS. Heim analyzes a recent essay by Rae where he argues that naturalist views of history and historiography have heavily influenced certain ranks of biblical scholarship. Heim builds on this charge and contends that Scripture’s view of history assumes certain epistemological ideals that need to be adopted by modern interpreters so a “theological” understanding of history can be applied to the process of biblical interpretation. The third article is written by Peter J. Leithart who is the President of the Theopolis Institute in Birmingham, Alabama and adjunct Senior Fellow of Theology at New St. Andrews College in Moscow, Idaho. Leithart provides a test case in TIS methodology by working through several exegetical complexities in the creation narrative of Genesis 1 so he can flesh out the implications that the account has for the issue of divine timelessness. The fourth article is provided by Tamra Hernandez who is the Executive Research and Editorial Assistant to the President at Southwestern Baptist Theological Seminary in Fort Worth, Texas. 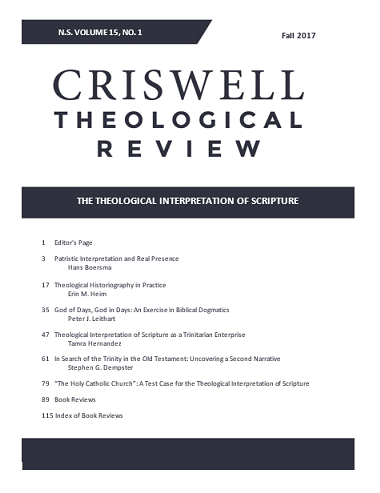 Hernandez notes an important feature that many TIS advocates emphasize regarding the need to see biblical interpretation as a confessional enterprise. Many argue that such a belief necessitates a reading of Scripture that is inherently Trinitarian. Hernandez works through some of the complexities of this proposal and makes some suggestions on how such an approach can move forward. The fifth entry is written by Stephen G. Dempster who currently is the Stuart E. Murray Associate Professor of Religious Studies at Crandall University in Moncton, New Brunswick, Canada. Dempster responds to the skepticism that some express toward the idea that Trinitarianism has legitimate exegetical roots in the unfolding storyline of the Old Testament. Dempster contends that there is a clear divine plurality substantiated within the Hebrew Bible. It begins with a distinction between the Lord and his Spirit and then later expands with the descriptions of a Messianic deliverer. Finally, our last entry is by A. Boyd Luter who is teaching professor at The Kings University in Southlake, Texas. Luter analyzes two significant evangelical voices in the TIS forum, Kevin Vanhoozer and Daniel Treier. Luter surveys their contributions and hones in on the application of the “Rule of Faith” to the task of interpreting Scripture. While helpful to a degree, Luter thinks this strategy requires more clarification so it does not inadvertently become a methodological haven for supersessionism. Following these articles are twelve book reviews that inform readers about works which can improve their theological libraries. And also remember that past issues of CTR can be accessed online at atla.com. Your local university or seminary can provide you with a password.